Labour has held the South Yorkshire seat of Rotherham in a parliamentary by-election with the UK Independence Party taking second place. Sarah Champion secured the seat with 9,866 votes - 46% of those cast. UKIP's Jane Collins came second with 4,648 votes and the British National Party's Marlene Guest came third on 1,804 votes. The by-election was called following the resignation of the former MP Denis MacShane on 2 November. Mr MacShane stepped down after he was found to have wrongly claimed at least £7,500 in expenses. He had been MP for the town since 1994. 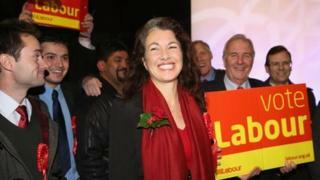 Labour described Ms Champion as a "clean break" candidate following the scandal surrounding Mr MacShane, and she becomes the first-ever woman MP for the seat. Speaking after her victory, Ms Champion said: "I've never stood for election before but when I see the damage David Cameron is doing to Rotherham I cannot stand and watch. Ms Champion, chief executive of a children's hospice, said she was not a career politician and will serve "not for what I can get out of it but what I can put into it". Mr Farage, who was at the Rotherham count, said the result was the party's "best ever" at a by-election. "It's big progress. It's a big night for UKIP," he added. UKIP's campaign in Rotherham was boosted by a row over a local couple who had their foster children removed by the Labour council because they were UKIP members. There were 11 candidates standing in the by-election and the turnout was 33.8% - down from 59% in the 2010 general election. Labour also won by-elections in Croydon North in south London and Middlesbrough.